Fall adventures continue, aided by stellar late Indian Summer weather. It's pretty crazy when early-November is nicer than early-June, but that's how it's been around here this year. 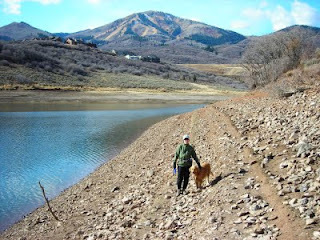 We've been slowed a little recently by the ubiquitous flu, but Joanne, Bridger & I managed to rally for a nice Sunday morning jaunt around Jordanelle reservoir, with Deer Valley ski area in the background. Not a bad scene. 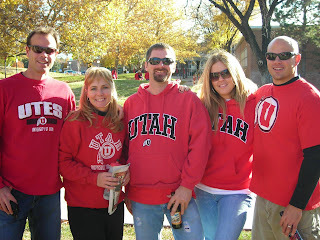 Saturday was University of Utah football. A narrow early-season loss to Oregon haunts an otherwise perfect season, but bowl opportunities are still looking good and it was great to connect with our brothers & friends. Absolutely gorgeous conditions, and always fun to visit our old stomping grounds. Go Utes! 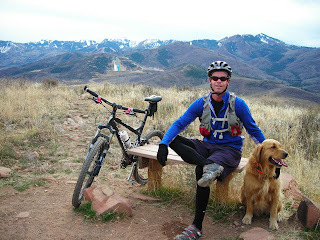 The piece-de-resistance was a sweet mountain bike ride on the Glenwild trails... November 11. Incredible to be out there in 60-degree conditions. A couple of snowstorms are forecast in the coming days, so we'll likely be switching bikes for skis next week. Stay tuned.